Electrotherm develops and manufactures In-House Fluxless magnesium recycling solutions for the magnesium die casting industry. Recognising both the financial benefits in using recycled materials and the increasing industrial concern for environment welfare, Electrotherm offers an oppurtunity to benefit from a new recycling system. 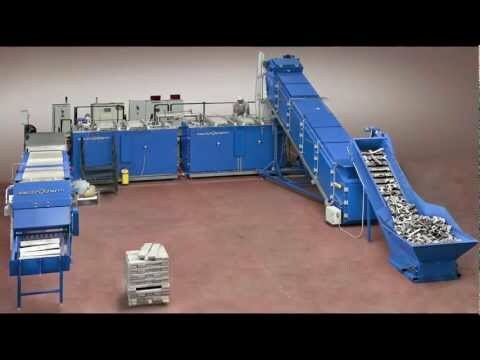 The system allows to employ a clean recycling process and to place the recycling operation adjacent to the die-cast machines. The process, enables high purity, chloride free primary quality material. EFRS-500 successfully recovers 93% of Class A1 scrap with a prime material quality. Electrotherm Fluxless technology is a viable and effective recycling solution for both convrntional alloys such as AZ91D and AM60 as well as new alloys containing alkaline and rare earth elements. Electrotherm develops and manufactures EFRS In-House Fluxless Magnesium recycling solutions for the magnesium die casting industry. Electrotherm develops and manufactures In-House Fluxless magnesium recycling solutions for the magnesium die casting industry.